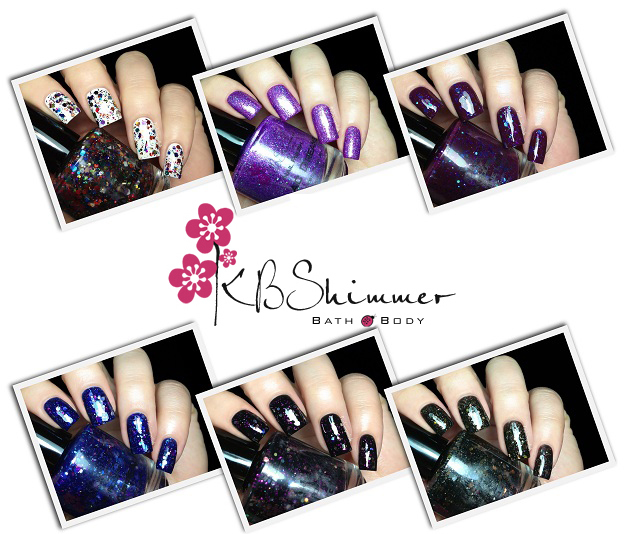 I hope you're as excited as I am because today I have more KBShimmers to show you! 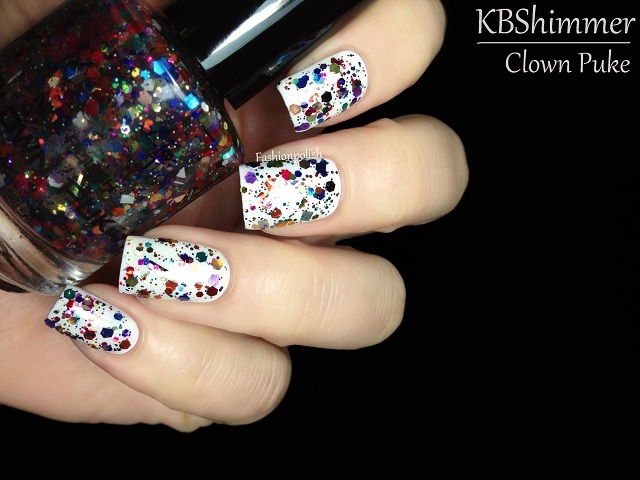 Clown Puke is a multicolored glitter bomb in a clear base. Small, medium, big, hex, square, bar,... in every possible color! It screams Mardi Gras or Circus to me and I really love that it's completely different from all of the multicolored glitters released by mainstream brands. I dabbed one thick(ish) coat over white in these swatches and didn't experience any trouble with application. 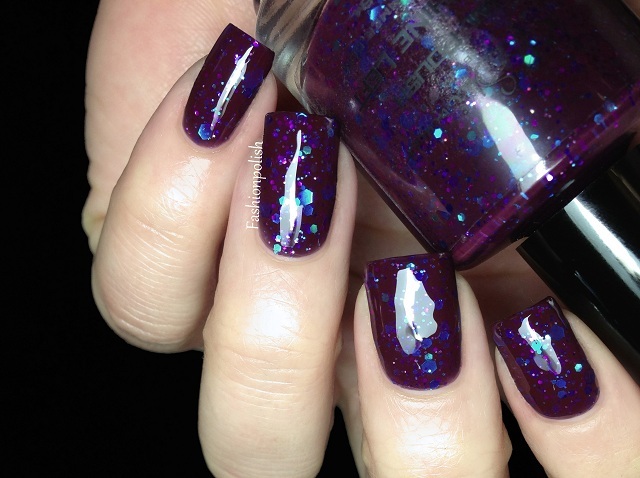 Lilac Dreams is a lilac shimmer scattered with blue and hints of silver micro glitter. It's completely unique in my collection and if you're into purples as much as I am, you probably won't pass it this one. I used 2 easy coats in these swatches for full opacity. Hex Appeal is another stunner : navy blue jelly combined with blue silver and pink hex glitters as well as some really small bars in the same colors : LOVE! Formula was very similar to No Whine Left and required 2 coats for full opacity. 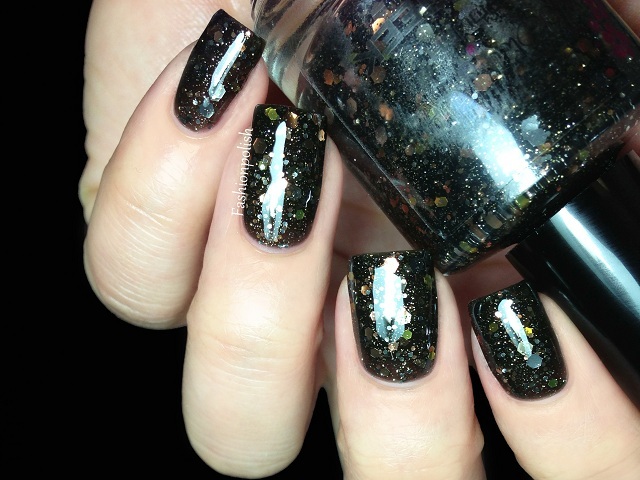 Showgirl is a black jelly base with pink, silver, black and holo glitters. The black base is on the sheer side but still opaque enough to achieve almost complete coverage with 2 coats but you're going to have to trust me on that LOL. I swatched it on its own and over black but I can't seem to find the first pictures... I'll definitely look some more and post them if I can. This is one easy coat of Showgirl over black plus topcoat. And finally, Band Geek. This is the one I was the most excited about and omg it did not disappoint! Black base literally packed with tons of gold, copper and silver hex glitters in every possible size... Right up my alley! I used 2 easy coats plus topcoat here and I love the result. I am seriously impressed by KBShimmer. If you've tried as many glitters as I have, you know how hard it is to get both good glitter pay-off AND avoid thick formulas. Of course, some colors are a little bit more challenging than the others but they're still very manageable in my opinion. Do you own any KBShimmers? Do you plan on getting some more? I know I am! I JUST LOVE YOUR PHOTOS! :) That being said, I adore Lilac Dreams! I don't own any KBShimmers yet, but I hope too soon! I own a few KB Shimmers and look forward to getting more. These folks mix some beautiful polish and DAMN, they get those orders out fast. Mine was at my doorstep in three days (I expected it would take a week). Personalfave right this very sec? Band Geek. I'm totally in love with KBShimmers, and own 20+ of their polishes. Can't wait for the next collection. 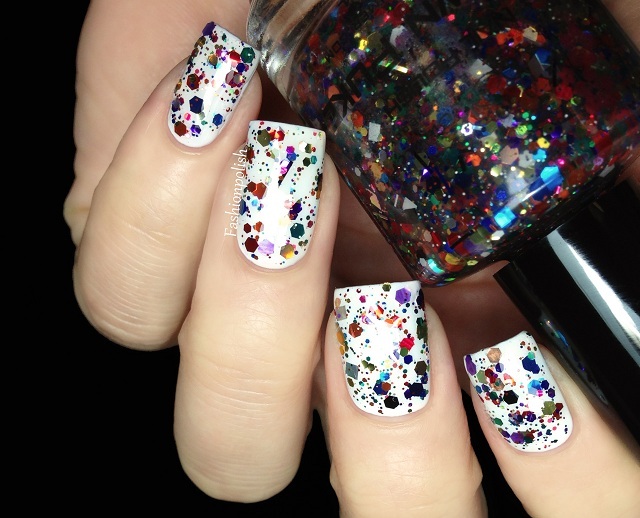 Ooo these are lovely polishes, thanks for sharing. Oh these are really stunning! I ordered some last week! I've been eyeing them for a while :) I ordered Hex Appeal and Berry Patch. I love that they are a jelly sandwich in a bottle! These are all gorgeous!! I think I like Hex Appeal and No Whine Left are my favorites! Need to say: "Clown Puke" is an awesome name! Gorgeous! I especially like Showgirl. I am drooling ALL over my keyboard. Lilac dreams is a stunner! And Hex Appeal is by far my favorite. 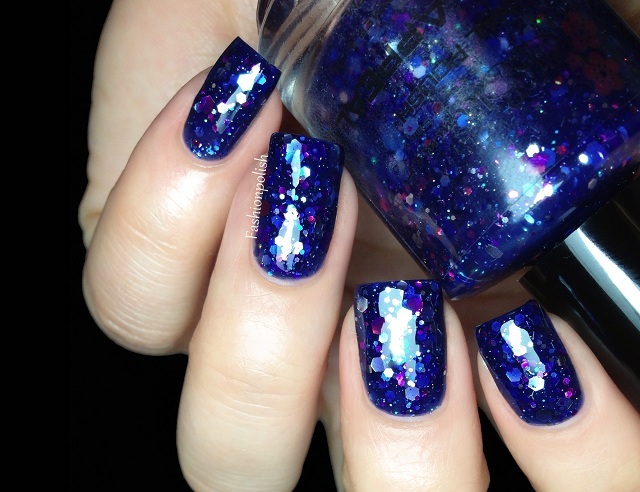 I just ordered (3) KBShimmers this week including "Oh Splat." I can't wait for it to arrive. This company looks like they have amazing polish that I can't wait to add to my collection!